Rebecca and I had a great time today in Esslingen at the annual Esslingen Weinwandertag, an annual wine hike through the vineyards surrounding the town of Esslingen. We started off in Esslingen and wandered up a path leading to the vineyards and a few hours (and many wine glasses) later we arrived in Mettingen. 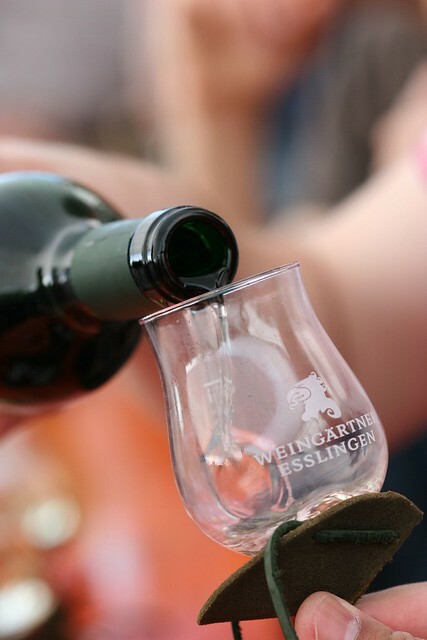 At the start in Esslingen, we purchased a wineglass with a leather strap that brilliantly holds the glass upright around your neck, and every few hundred meters along the path we filled up with some delicious local wine and German snacks. We ran into some of my co-workers so we made the rest of the trek with them, which made for never empty glasses. It's a brilliant festival and loads of fun. These kinds of events are what's missing from life in America.